I had forgotten to do this earlier, as I did for our first quarter, but here is something to print out or use in some way as a guide for your readings. I made it about a half page, so you can tuck it right inside most Bibles. When you’ve got 5 minutes to read, you don’t want to waste 2 of them trying to figure out what we’re supposed to be reading that week. So keep this, or something else like it, handy. I hope it helps. Just a little update here about the very large editorial staff for this site and its resources. They do not exist. So if you find a post with one minor typo, that is a success. I personally still cringe whenever my wife draws them to my attention, but I have slowly learned to live with it. But sometimes those typos create more confusion, like this week’s focus passage. My apologies to any who have looked at it and had no idea what I was talking about. I made a couple of scripture references that made no sense–not even to me as I looked back at it. One was the wrong chapter and another left out the chapter reference altogether (making it appear as though I suggested you casually go back and read 14 chapters). I have since made the corrections. Sorry for any inconvenience. The file is posted below. If you ever find a major typo, feel free to let me know. Leave it in a comment or a send an email. I’ll take them gratefully as humility reminders. I know that the Lord has given you the land, and that the fear of you has fallen upon us, and that all the inhabitants of the land melt away before you. For we have heard how the Lord dried up the water of the Red Sea before you when you came out of Egypt, and what you did to the two kings of the Amorites who were beyond the Jordan, to Sihon and Og, whom you devoted to destruction. And as soon as we heard it, our hearts melted, and there was no spirit left in any man because of you, for the Lord your God, he is God in the heavens above and on the earth beneath. The spies return, only with the help of Rahab who has had also saved them from their enemies, and they bring the message that the people melt away because of Israel. It must have been a bit humbling to hear greater conviction in the ability of God to deliver the land to Israel from the mouth of a prostitute than from the God’s own people a generation ago. At that point, the Israelites were overwhelmed with fear at the size and strength of the people and the spies (not including Joshua and Caleb) convince the people to act on that fear. As this was happening in the Israelite camp, as they were figuring out a plan B so they wouldn’t have to match up against the supposed giants of Canaan against whom they thought they were no match, the Canaanites were melting away in fear. Israel couldn’t trust that their God, who had already done so much for them, would take them to the land he promised. But Israel’s enemies could. They knew of God’s power and were frightened. Fear was the appropriate response, but only for one of the groups. For those who should have put their trust in the Lord, there was no need to fear. Now Israel approach the Jordan and Jericho, the promised land, probably wishing they had heard from Rahab 40 years earlier. I was waiting to pick up some pizzas yesterday afternoon and saw part of an interview with Lebron James. 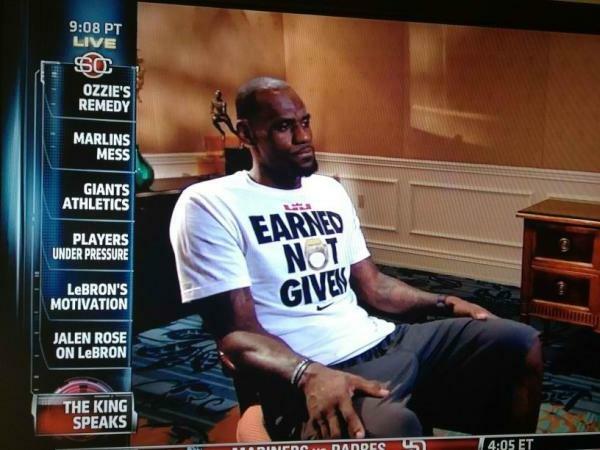 Having just won an NBA championship, he was wearing a shirt with the big, bold words that read: EARNED NOT GIVEN. For those who do not follow sports much, Jams is saying that the ring he won is not undermined because he won it after joining other superstars at the Miami Heat. He still can boast in his achievement since he doesn’t think it was just handed to him. Earned, not given, is truly a desire of all men and women. We want to achieve and boast in what we do. But the reverse is true in what matters most of all. In Joshua we are going to see Israel receive a land that they have not earned. They should all put on shirts that say, GIVEN NOT EARNED, and wear them proudly. Moses had reminded them of this and looking back on their history they must know that to be true. The Promised Land is not a reward for their efforts, but a gracious gift of God. Thousands of years later the story hasn’t changed. As we read another gospel and get into the letters in the New Testament, the truth is that God’s grace is given, not earned. What is most important in life is received. It is our relationship with God. We must be reconciled to him, and we could never do that by our own strength nor could never earn the love he gives us. If you ever see those EARNED NOT GIVEN shirts around, remember that when it really counts, the reverse is true. God’s grace is given, not earned. Today we had a lunch after church to celebrate the end of our first quarter of Year in the Bible. Looking back it is a great amount of reading that has been finished and so many of the big stories of the Bible have been covered. You’ve really accomplished a lot in just a few months. 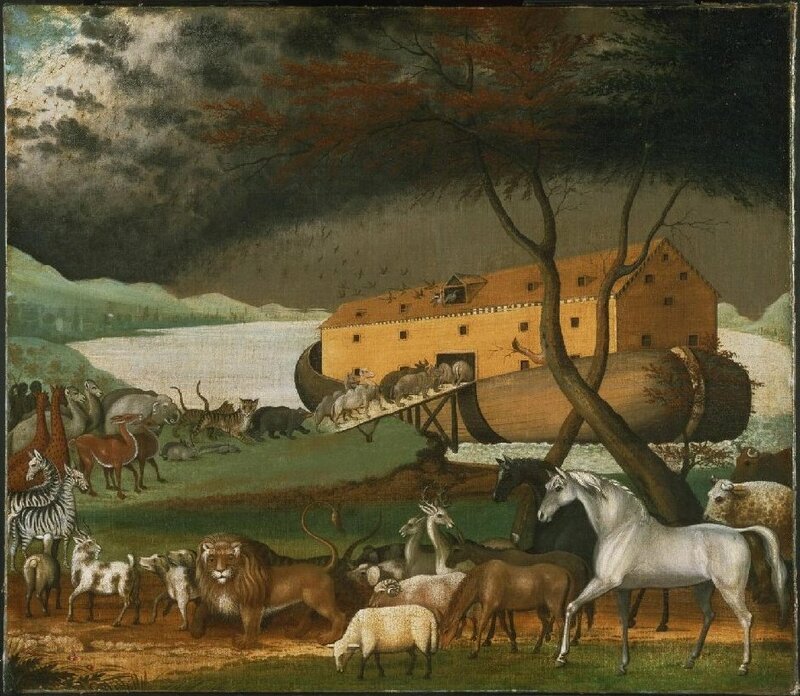 Noah Ark – One of the many well-known stories of quarter one. We’ve gone from creation to God’s people readying themselves to enter the promised land. In between God has shown himself to be faithful and true, strong and mighty, full of grace and mercy, as well a God of judgment who does not tolerate sin. God has chosen a people for himself, beginning with Abraham, and has provided all that was needed. But God’s provision and sufficiency ironically never seem like enough and Israel always turns away. God meets this faithlessness with his grace. There is judgment, like 40 years of wandering, but God never ceases being a God for us. God is never revealed more clearly as for us than in Jesus Christ, of whom we read about in the New Testament. We read John and Luke who present to the reader the gospel, and that is the story of Jesus Christ. God is for us and has stopped at nothing to make us his own, and this means that God came to earth in Jesus Christ and took our sin upon himself, dying the death that we deserve, so that we can be reconciled. Now we a sinful people can be with a holy God. In response to such an amazing, world-changing event, the lives of the disciples of Christ can never be the same. In the book of Acts we see the way in which the church exists in light of the death and resurrection of Christ, as empowered by his Spirit. Now in quarter two we take up both of these strands and follow the story further along. 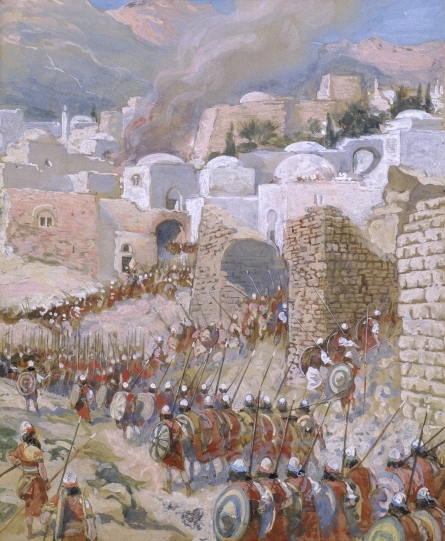 The promised land, which has been held out before Israel, is finally occupied in the book of Joshua. We’ll then see Israel move from prophets and judges to a nation that wants and gets a king for itself, just like all the other nations. This summer quarter will also give us a chance to read all of the minor prophets who speak against the nation, calling for its people to return to God and to his ways. The church that finds its footing in the Roman empire is still in need of help and encouragement and we’ll read many letters that were circulated to do just that. These are the letters of Paul and Peter, who sought to build up the people and strengthen the small group of believers who would one day rise up from under the oppression of a hostile culture to be a force for the kingdom of God. That’s what we’ll have to look forward to this summer quarter of Year in the Bible, starting this week. Hope you can stay with it. I’ll be praying for you and for your time spent with God in his word. Tune in tomorrow after church to get the full low down on the weekly “story so far.” We’ll look back at the big picture at our Review/Preview lunch. Then we’ll have a more substantial post to intro our Summer Quarter of Year in the BIble. We’ve come a long way from creation to the doorstep of the promised land in the Old, and hearing about Jesus Christ to seeing his church take shape in the New Testament. I pray it has been a wonderful experience so far. Have you had any great experiences with your time in God’s Word? We began Year in the Bible a few months back as a way to continue with the tools our church had learned in a previous study. We learned better ways to study the Bible–how to read it, meditate on it, ask better questions, pray through it, etc. But to learn the how and then fail to put it into practice would have been a waste. So here we are, reading the whole Bible. In your devotional times, have you been able to gain a better understanding of Scripture? Have you had new insights? Has it helped you to have a better vision of who God is? Has your dedication to the Word worked itself out in your life in ways you didn’t expect? If you have some story to share, I’d love to hear it. To hear of the varied ways that the Spirit works in us can be a great encouragement and comfort to other brothers and sisters.